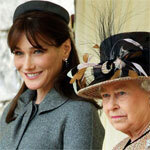 France in London | France-United Kingdom: best of friends or best enemies? France-United Kingdom: best of friends or best enemies? Agincourt, Orléans… Who could forget so many years of war? Not the French for sure. 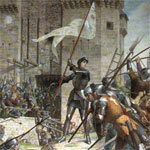 Some of them seem to be still mad at the English for having burned Joan of Arc… Never touch a national symbol! And as if it was not enough to fight on European soil, French and English fought all over the world. In America, for the control of Ohio and Canada, in India… The world seemed to be too small for these two countries and their thirst for power. We owe the last Franco-British war to Napoleon I, consecrated Emperor of France in 1804. After he had triumphed on the European continent against the major powers, Napoleon contemplated an invasion of Britain. But he was soon dissuaded with his defeat at Trafalgar in 1805. In response, Napoleon tried to isolate Britain from the rest of Europe in the aim to weaken it. He did not really reach his goal, since the Brits put an end to the Napoleonic era at the Battle of Waterloo in 1815 and shipped Napoleon to St Helena. After that, the relations between France and Britain slowly began to improve. The reason was simple: they had found a common enemy: Prussia. Its dangerous will to unify Germany was seen as a great danger by the rest of Europe. Prussia became the official first enemy of France after Bismarck “stole” two of its regions Alsace and Lorraine, after the Franco-Prussian war in 1870. In addition, to ensure that France would never be able to take revenge, Bismarck tried to weaken France by isolating it from the other European countries. As a result, France searched for support from Russia, and… the United Kingdom. The British felt also threatened by the new Germany and its expansionism. So, the two countries signed an agreement in 1904, the 'Entente Cordiale', which resolved the differences between the two countries about their colonies in Africa, America and Asia. Even if it was not an alliance, this agreement marked the beginning of a peaceful era between France and the United Kingdom. 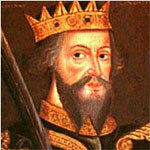 For the first time since 1066 they would agree to be friends and agree to fight against a common enemy. They were allies. This was put to the test first during the First World War against the Central Powers after France and Belgium were invaded by the German army. They fought again together during the Second World War after their policy of appeasement towards Hitler’s Germany failed. However, even if they were allies during these two wars, we can’t say that the cooperation was always wonderful between France and Britain, especially during the Second World War. First, the relations between Charles de Gaulle, the leader of the 'France Libre', and the then Prime Minister, Winston Churchill, were quite strained. In addition, the Brits were concerned that the terms of surrender accepted by France would allow the German to use the French fleet against the Royal Navy. So, Churchill ordered the sinking of the French fleet in the Algerian port of Mers el Kebir in July 1940. In total 1297 French sailors died. This gesture was long considered as a betrayal by the French. 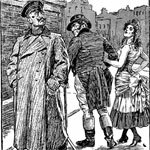 De Gaulle and the Free French who joined him in London were not made very welcome. They were in fact, reminded that they were second class citizens. This was not helped by the fact that de Gaulle and Churchill reeally disliked each other. After the Second World War, old rivalries came back. 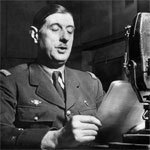 The best example is probably the famous veto of Charles de Gaulle as French president on the proposal that Britain join the Common Market. Asked in 1963 and 1967 to countenance the idea of London joining the then six-strong group of nations, the French president simply said: “Non”. And even if De Gaulle’s successors were more conciliatory, and more inclined to improve their relations with the United Kingdom, quarrels did not stop there. The list is long. There was the one over the intervention in Iraq, the 2012 Olympic games that London won over Paris, the European Constitution Treaty, mad cow disease… For some French, English people are still hypocrites, badly dressed, drink too much beer...would be perhaps better if they drank wine instead of beer, and put mint gelly sauce on everything they eat. According to some Brits, the “Froggies” are arrogant, dirty, rude, and always on strike. Do you recognise yourselves or anyone you may know? 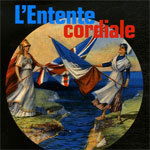 Are the French and the British irreconcilable? Of course not! France and Britain are a lot closer than one can think at first glance. Between the two countries, it's in fact a love hate story. Need proof? One cannot forget that London hosted the departure of the Tour de France in 2007, or that many the French soccer players such as Thierry Henri have won British hearts. On the other hand, more and more French people learn Shakespeare's language. How could they read the last Harry Potter otherwise before its French release? Since the 60s, English rock music and Bond movies are of course a big success on the other side of the Channel. Relations between France and England might not always be easy but our links are stronger than one might think. A true friend doesn't always say what you want to hear. Let's be friends forever. Thanks very much for this really interesting article. à propos des VOUS et TU,le malentendue ne vient il pas de l'enseignement de l'anglais et du francais dans les écoles de part et d'autre du channel? car selon mes maigres connaissances, l'anglais possédait l'équivalent de notre TU qui était, je crois, YE. donc, c'est le TU qui a disparu. Les anglais se vouvoient tous, ce qui reflete en partie la structure sociale et la mentalité britanique, je crois. andrebhampford lol well said. thanks for the very informative article, by the way. The United Kingdom is a very interesting place and its history is very rich, nevertheless France, French language and culture were the startup of the British development as a cultural nation. One can see it by how widely English (the language) was influenced by French. It is practically impossible to write a long sentence or speak a phrase (in English, obviously) with more than seven words without using a Latin word, whilst one can tell a story in French without using an English/Germanic word. My mother is French, my father is British and I was born in South America, and I really consider myself as a citizen of the three countries to where I belong, but I need to say that Britons have no reason to call French arrogants for not speaking English in France since no one speaks French with you in England. This talk of "English as world language" is hopeless because France is a sovereign country and its official language is French, not English. Nor can the French say that the British are rude because people in France can openly ignore you if you do not use "vous" (a formal treatment) to refer to them, as well as the English will not feel tempted to help you if you faint in the tube in case it implies in missing the train. My message is that it is better to look back at ourselves before pointing others' defaults. ...France and England or France and Britain. I believe after the union of 1707, England's status of a "nation-state" disappeared and the French rivalry was now with Britain, yet you continue to use England and Britain as the same political entity!! !